Catawissa, PA - Live Coverage from the Inaugural Numidia 150 goes live Friday morning 8:30 am E.S.T. and continues thru the weekend at Numidia Dragway in Catawissa, PA.
Numidia, PA - In Comp Eliminator, Jay Schonberger out of Philadelphia bagged his first win after James Primozic went red with the foul start. Peter Luciano won in similar fashion in Super Gas when Derek Clark left .005 seconds too quick giving Lucian his first win since 2015 and his first ever in Super Gas. 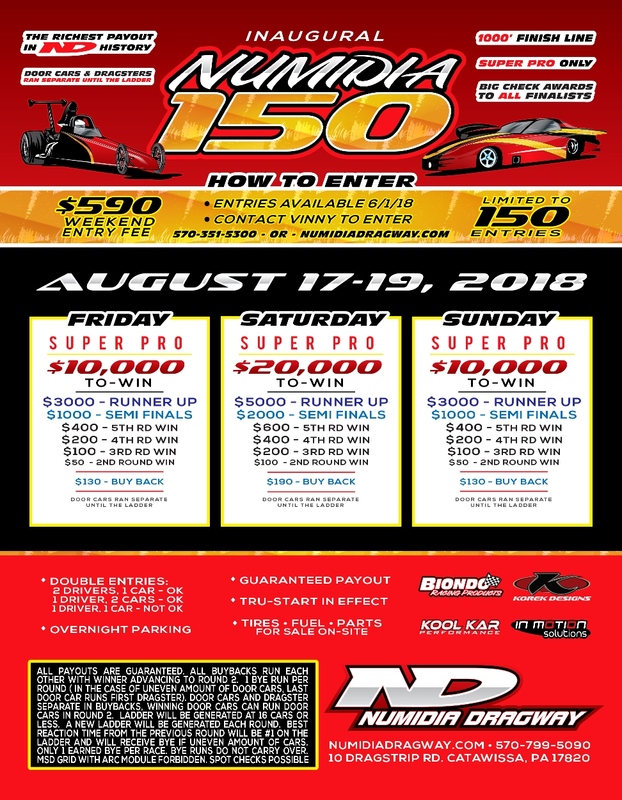 Atco, NJ - The team from Numidia Dragway raced to the coveted Team Championship at this weekend’s NHRA Summit Racing Northeast Division Finals at Atco Raceway. 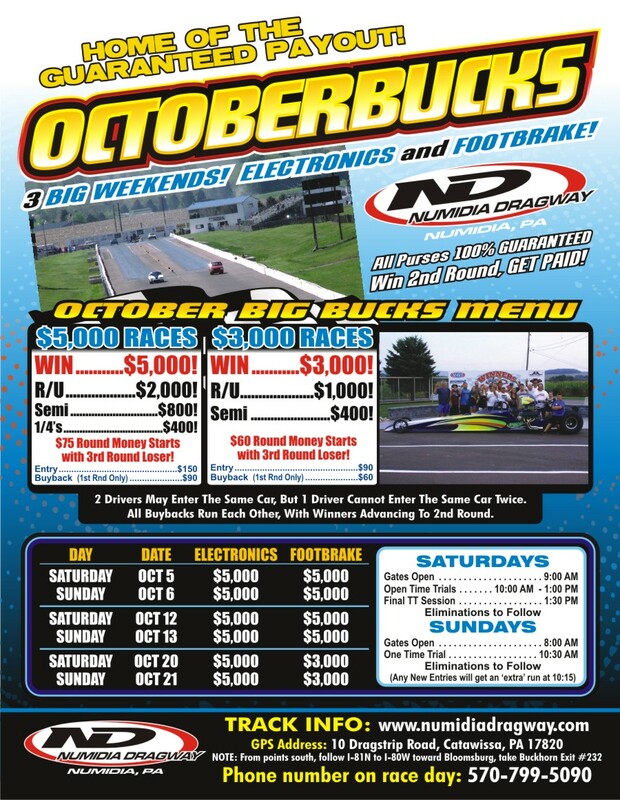 Numidia, PA - Home of the Guaranteed Payout, Numidia Dragway will be hosting the OctoberBucks Big Bucks Race this weekend. Second round winners get paid. Electronics and Footbrake both contested. Catawissa, PA - The 2nd annual Ronnie “Uncle Buck” Memorial Race presented by Nitroplate & the Nitroplate Stock / Super Stock Shootout presented by AutoMeter is shaping up to be one of the best sportsman races on the East Coast. Gallatin, TN - Thank you to Mark Dennebaum for submitting this video from Numidia Dragway. We are working on a program to showcase video from our DRR Members on a regular basis. Click here to see this video. 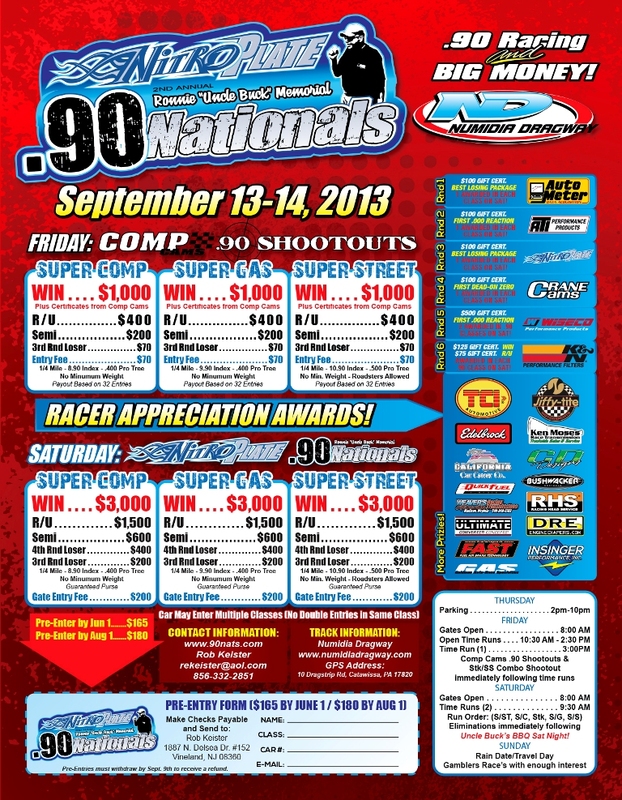 Catawissa, PA - Electronics and Footbrake Both Paying $5,000 to win this Saturday and Sunday, October 6th and 7th. The team from Numidia Raceway took home the coveted NHRA Summit Racing Series Team Championship for the second year in a row, with a 3-point win over Old Bridge Township Raceway Park at the NHRA Northeast Division Summit Racing Series Finals at Lebanon Valley Dragway. 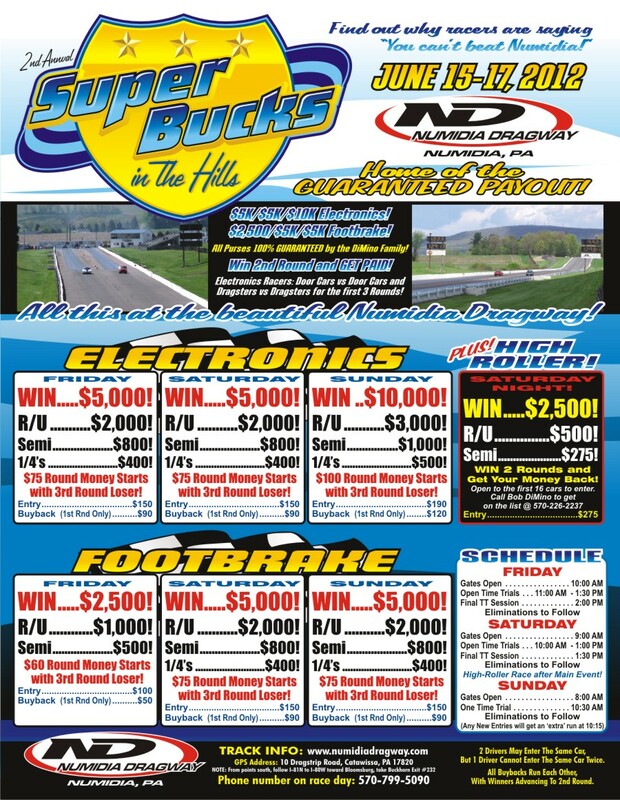 Numidia, PA - Numidia Dragway in PA, known as the "Home of the Guaranteed Payout" will be hosting their 2nd Annual Super Bucks in the Hills Race this weekend. Big Bucks are on the line in Electronics and Footbrake all 3 days.